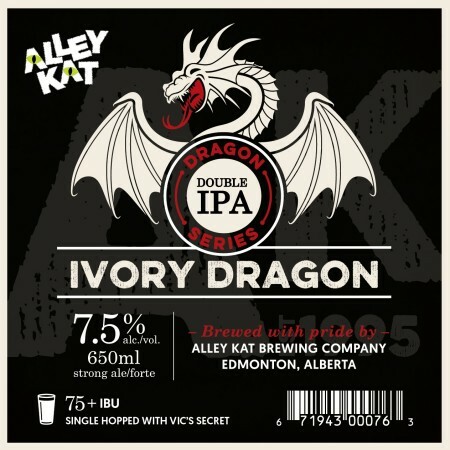 EDMONTON, AB – Alley Kat Brewing has announced details of two new beers that are being released later this week. Ivory Dragon (7.5% abv) is the latest in the brewery’s long-running Dragon Series of limited edition Double IPAs, and the first in a new sub-series of paired releases. Single hopped with Vic’s Secret to provide “notes of pineapple, pine, and passionfruit,” Ivory Dragon will soon be followed by Ebony Dragon. Prairie Pounder and Ivory Dragon will both be released tomorrow (February 7th), and will be available at the Alley Kat brewery store and select liquor stores and bars in Alberta while supplies last.